Faithfulness In A Quiet Season. "Blessed be the Lord , for he has wondrously shown his steadfast love to me when I was in a besieged city. I had said in my alarm, "I am cut off from your sight." But you heard the voice of my pleas for mercy when I cried to you for help. Love the Lord , all you his saints! The Lord preserves the faithful but abundantly repays the one who acts in pride. Be strong, and let your heart take courage, all you who wait for the Lord!" Do you feel a separation from God like the text says the psalmist felt while saying "I am cut off from your sight"? I encourage you to look where you put your trust and control. If it is in yourself and your own abilities this could be the reason for the disconnect. It says " He abundantly repays the one who acts in pride." It can be a form of pride for us to think we can control our way back to hearing Him. Take hope though! If you are truly seeking the Lord in everything and there is still a disconnect, it could be God putting you in a place to learn something to be revealed later. That could be deeper reliance on Him, Contentment in Him, and many other things. Whatever He has you in this season for remember He is faithful! His timing is amazing, God will show you His power in ways that you couldn't imagine. Do you know why? Because He is God and we cannot plan His ways. His Truth, Grace, Power, and Character stay consistent. All we can do is "Be strong, and let your heart take courage" as we wait in hope and excitement of His great plan. The biggest thing to understand is that God can be silent for a season, but He is still there! It is crazy to me how He works! He can stay silent so we His children can turn back to Him stronger and more at peace than ever, knowing He is in control! So "Love the Lord , all you his saints!" Because "The Lord preserves the faithful". What a peace we can find in Him. I pray you all have a blessed day and week, may we hold our thoughts captive to God's word and be faithful so He can show His loving character and plan. Lord, thank you for your wondrously steadfast love. 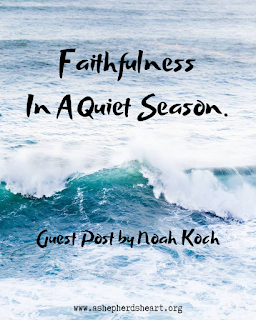 We're blessed to introduce Noah Koch as a new guest contributor to A Shepherd's Heart. He hails from the Pacific Northwest in the USA where he actively and passionately lives life on purpose for The Lord. He's very creative and talented as a communicator, photographer, musician, and writer. He has a true servant's heart. We prayerfully look forward to further guest posts from Noah in the future! Please check out the latest encouragement video about Hungering and Thirsting for Righteousness.